For most sales teams, “personalizing” a cold email simply means referencing a person’s job title or company and sending them links to case studies or blog posts in the hope of generating a single click-through. The conversation typically ends after that click. As sales people we might follow up with lots of “just checking in” emails, but these can feel spammy, and there are minimal results to show for it. At Intercom, we tried something different. We knew from our own research that leads are 82% more likely to convert to customers if they’ve chatted with you first. So we began using our live chat tool – typically viewed as a tool for responding to website visitors – to continue engaging cold email leads. For instance, if you receive an email from me with a case study, and you click on the case study, you’ll be greeted with a Visitor Auto Message, or a proactive live chat message, inviting you to chat with me. As an outbound SDR, this approach has drastically reduced the amount of time it takes me to schedule demos, and also creates meaningful, personal engagement at scale. I typically see near 100% open rates for these types of messages and an over 25% reply rate. I’ll walk you through the full campaign and then show you how to set this up in Intercom. As sales trainer John Barrows once told us, our job is to create context around the content that marketing creates. In Sales, we’ve built a catalog of content organized by the roles of our prospects and the problems they are looking to solve. Armed with the right collateral, we blend research, personalization and the content to write outreach emails. I noticed from your LinkedIn that you doubled ExampleApp’s web traffic by 27% last quarter. Congratulations on that accomplishment! Your successful demand gen campaigns might actually be causing a conversion problem. As the number of form fills increase so does the length of time prospects wait to hear back from your sales team. Tradeshift felt this pain too. They replaced contact forms with live chat to reduce lead qualification days from 21 to 3 and increased sales by 32%. Do you have a few minutes to chat? When crafting the second message, we acknowledge that the prospect is visiting after receiving my email or note. A simple “Welcome back!” or “Thanks for checking out my email” avoids the notion it was a coincidence that the prospect received the message. Soft call-to-actions like “Do you have any questions?” or “How can I help?” have also been very effective for the first visit from a prospect. Using this process, I’ve been able to have valuable real-time interactions with prospects where we can quickly determine if Intercom is a good fit. Our new scheduling feature makes it even easier to move the conversation forward; I’ve been able to qualify prospects and schedule meetings in under five minutes rather than the hours often spent on back and forth email chains. Create a UTM code to the landing page URL you’re adding to your email. I generate unique codes for my personal prospects. To keep things organized, I use my initials as my personal UTM code: “?nml”. That way, each email recipient gets their own personal greeting. Add the unique URL to your email, and hit send! By modifying the triggers of the Visitor Auto Message, different messages can be customized with additional rules, like the number of times the prospect clicks or even the specific piece of collateral sent. 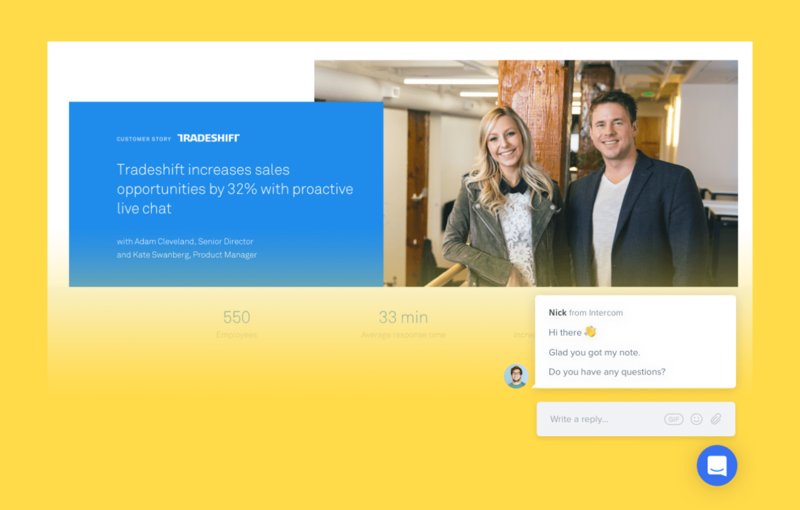 Most people view live chat as a tool for responding to inbound leads, but one of the most under-utilized benefits we’ve seen on the Intercom sales team is to warm up the cold outreach experience. A personal welcome on the website after a cold email provides the prospect with a familiar face and a way to continue the conversation. This new approach to live chat as a part of cold outreach has turned outbound emails into inbound conversations. Even better, these inbound conversations quickly become an opportunity to build a relationship with a future customer.